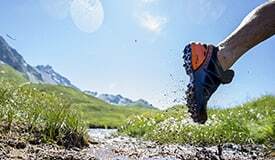 The Trovat Guide High GTX Men’s Walking Boots from Mammut are built for the outdoors. Constructed from Nubuck leather for a strong durable shoe on tougher surfaces, the boot features a rubber heal and tip for extra protection. The GORE-TEX Performance Comfort Footwear membrane is 100% waterproof and provides essential climate control for all year-round comfort. 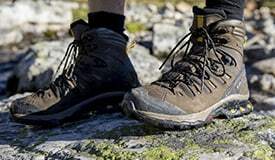 The 3-zone lacing allows for a secure supportive fit on long walks and hikes. For optimum comfort the boot features a GORE-TEX tongue construction and memory foam. The proven Vibram sole provides exceptional stability on all surfaces.